Blogging is known as one of the most effective and powerful way to make money online, but still many people do not know how to do it. There are various ways that helps you to understand this most powerful online skill. I have been asked by many people what are the best ways to make money online doing blogging. Today I am going to share about how you can make money blogging. When you start a blog the very first thing which blogger go for when it comes to monetizing blog content is Google Adsense. Why Google Adsense because it is for everyone. Anyone who have a good blog content can apply for Adsense. When you get approval you can use Adense ad codes to show ads on your blogs and make money when someone clicks on these ads. You can get help of Adsense guide to learn how to do it. You can also apply for BING ad network, but for this you have to be a strong quality content. Bing ad network is also compatible with Adsense. Affiliate marketing is one of the most profitable way to make money online. In affiliate marketing you will promote product and services of other businesses and get commission when someone buy the product or service on your recommendation. You can Join various affiliate networks such as ShareaSale, eAskme affiliate program, CJ etc. Direct Ads are also a great way to make money blogging. But to make money with Direct Ads you need to have a huge amount of monthly traffic. You can apply for BuySell Ads, but it easy as they accept websites and blogs with huge traffic. If you get accepted than you are allowed to sell your blog ad space and make money when someone buys that space. Native Ads are also helpful if you want to make money by showing recommended content after the end of every article. This is also helpful to make money if you have good amount of traffic. There are sites like Taboola, Content.ad, revContent etc which pays you to make money using native ads. Writing and publishing review or sponsored posts on your own blogs also help you to make easy money. When your blog gets popular you get many offers from clients around the world to publish about their products and services on your blog. This helps you to make good money as you can get up to $1000/sponsored post. 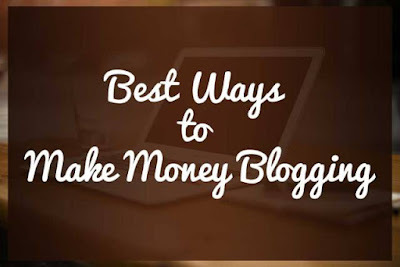 Now you see these are top 5 best ways that helps you to make money blogging easily, but for this you need to have a blog. So what are you waiting for start a blog and start your journey to live a Boss free life.